Age: In my 30’s….or can I say 27 and holding??? Tell us about your sports & fitness background. Not much to tell. I went to a small high school and we didn’t have opportunities for sports. As an adult, I was a part of lots of gyms and attended lots of classes but never really enjoyed any and I never felt connected to them. How did you first get into CrossFit? How did it go? Ryan and Ashley Lewis wouldn’t stop talking about it so I said I would go to shut them up (lol). I went, then I went again…and again…and I LOVE IT!! What impact has CrossFit had on your life? I found me again. In other areas I’m a mom, a wife, a business owner, etc. At CrossFit I got to be – me, just me. I got to do things I never thought I could do and do things I never even knew were possible (box jump, rope climb, deadlift). Like- what??? I can do that?? All of the friendships and support. Trust me when I walked in I knew NOTHING, I remember Coach Nate taking us to the whiteboard and saying “Today, we’re doing burpees” and I had this totally blank stare and had to ask “What’s a burpee?” Sadly, now I know. I love the people and how I feel now that I am a Crossfitter. 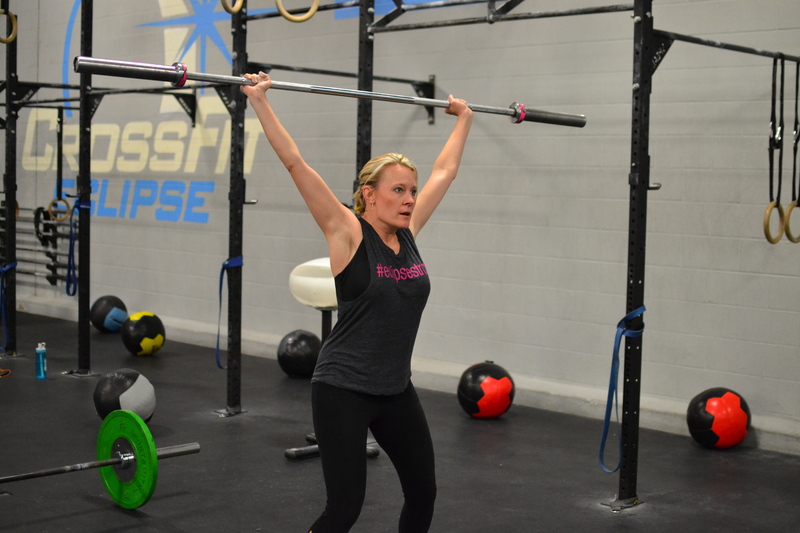 What is your advice for people getting started or thinking about starting CrossFit? Do it! Try it! Commit!! It will change your life for the better. What are your hobbies, interests, and other talents outside of CrossFit? First, I love God and love being involved with our church. Second, my family. John and my kids (Elizabeth & Ethan) are my joy. We love having family nights and playing games. The kids and I love baking and making new recipes. My passion – I love being involved with the outreach ministry at our church. I’m on a team that feeds 400-500 people each week. We started a medical clinic in February that provides free medical care to those in need and we partner with community partners to provide educational opportunities (parenting, budgeting, how to read, etc.) to help take people from where they are at and give them the tools to succeed.